Breaking Bad anticipation is reaching a fever pitch for the last eight episodes, with final announcements for the Talking Bad aftershow and a new trailer for the Mythbusters special that will tackle dissolving a body in a bathtub and the explosive properties of mercury fulminate crystals. 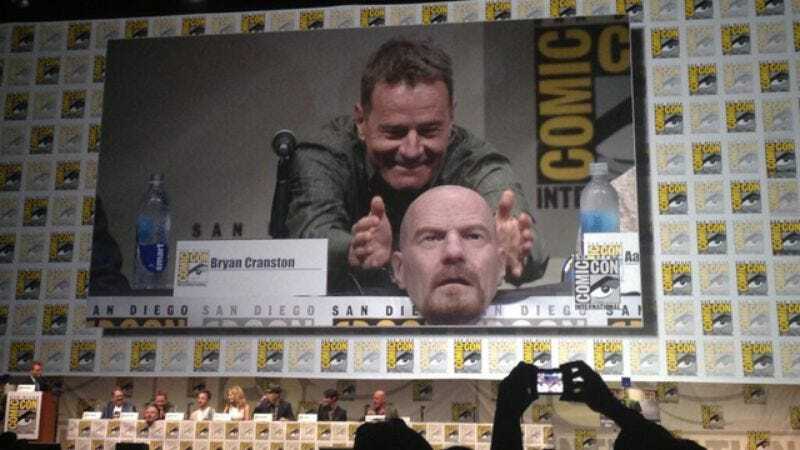 At Comic-Con in San Diego this past weekend, Bryan Cranston decided the best way to walk around the convention floor unfettered would be to hide in plain sight. So he did exactly that, donning a Heisenberg mask that perfectly disguised Cranston as merely a Breaking Bad superfan, then revealing the ruse at the show’s last panel before the final episodes air. It's yet another part of Cranston's slow shift away from the Walter White persona, something his natural comedic talent should allow him to do while ingratiating himself with many more fans.